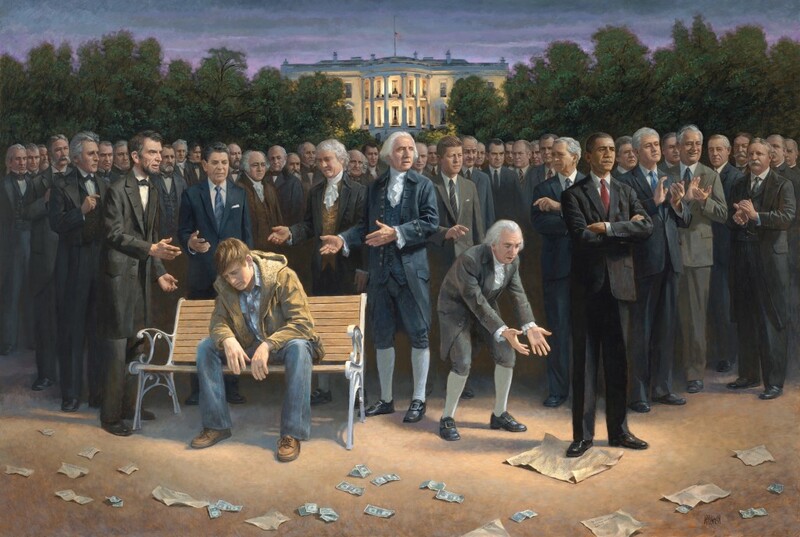 So the guy who painted Jesus holding the constitution has now painted a picture of the current President, Barack Hussein Obama, as trampling it. If you click over to the site you’ll see his reasoning behind everything… some of which I heartily disagree with. Further, while other Presidents, like Lincoln, actually trampled the Constitution, they are generally shown sympathetic… only Democrats and Progressives, such as TR, are shown upholding President Obama’s actions. He has a list of supposed crimes which the President has committed, but ignores a great deal of history of thought on the Constitution. He gets a lot right, actually, but connects the dots only around President Obama. I love that Clinton is clapping. I think it highly telling that the artist depicted the forgotten person as a Caucasian male. And i also find it telling that he felt the need to discount any racial aspect on his website. Its like when someone prefaces with, “Now I’m not a racist but….” and its followed by racist garbage. Didn’t Romney just tell us that he doesn’t care about the guy on the park bench? J Hammer, it’s one of the basic rules of the universe that any statement which begins, “I’m not a racist” will end with racist garbage. The guy has talent. Too bad he’s wasting it.